By now you should already be familiar with Switch, because he’s the scribe that writes the Feed, Photo Booth, and Chronicles these days. Hailing from the Bay, Switch is also known for 1) tattooing half his body, 2) not eating from the same plates as others, and 3) being fast-food-free since the 11th grade. Curious to find out more? Read on! Me: So are you ready for your interview? Too bad. So, who’s a better boss. Me or Ben? Ha. You. No, Ben. He pays. How come you have so many girls commenting on your Myspace page? I don’t know…They’re just the homies. It’s always good to have ladies around you. They can help you get into places quicker. They can help you get into places when there are long lines. Like the DMV? Or the womenÃ¢â‚¬â„¢s bathroom? Huh? No, like out at night. To like bars and clubs. Female, or a good looking female. So why can’t you just call them good looking females? Ã¢â‚¬Å“Beezie” sounds like a type of boogie board. Would you consider Tony a beezie? Some guy who works for us. Nevermind. Anyways, list these things in order of favorites: Beezies, Blunts, Skateboarding, The Hundreds, Scotty’s hair, the KKK. Skateboarding, Scotty’s hair, Blunts, The Hundreds, Beezies, KKK. So you like KKK the most? ThatÃ¢â‚¬â„¢s interesting. IÃ¢â‚¬â„¢d expect something more from someone who went to Harvard. Huh? I didnÃ¢â‚¬â„¢t go to Harvard. I went to Chico. You went to Chico? Then why do you front like you went to Harvard?! What? What made you think I went to Harvard? Because youÃ¢â‚¬â„¢re always using big words like Ã¢â‚¬Å“magnificent” and Ã¢â‚¬Å“congratulations” And you always walk around with that Harvard hat on, acting all hoity-toity. Sooo speaking of the KKK, did you deal with a lot of racism growing up? Not until I moved to Martinez in junior high. 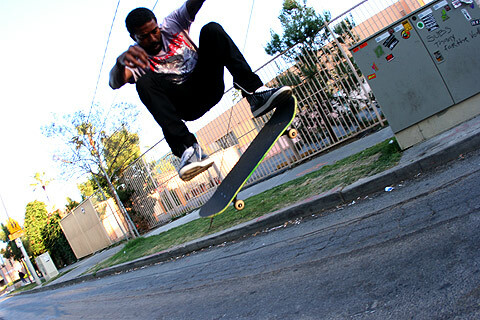 Went from an all-black class to being 1 of 5 black kids in the whole school…and I skated, so that was even weirder. Did they stare at you like you had an Alex-sized AdamÃ¢â‚¬â„¢s apple in your neck? They’d see me skating a ledge or just a hip and would be like, Ã¢â‚¬Å“Dude, you can’t skate Ã¢â‚¬¦blah, blah, blah.”, then I’d bust an ollie shifty mad high, and they’d just stand there like, Ã¢â‚¬Å“How can you do that? You’re black. And it’s like wha?! Then I’d go out to the pier with some of my homies and it’d be like whatever …black, white, everybody. 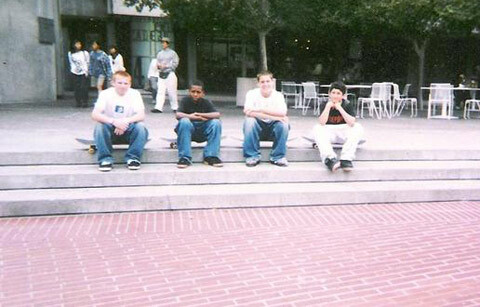 There was a black kid who used to skate in our crew named Sammy, but he couldn’t bust ollie shiftys because he was 300 pounds of pure fat. He’d focus every board just doing manuals. Later, he became a SHARP and waddled around on a Vespa. Anyways, time for some more random questions. Who’s your favorite skater? Growing up, Jason Lee and Koston, but now…I don’t really care. WhatÃ¢â‚¬â„¢s the best part about working at The Hundreds? Listening to you and Ben yap at each other. Haven’t had enough Switch? How about some *BONUS* FOOTAGE: During the credits for Western Edition‘s classic “Did It” skate video, you can see Switch (with dreads) toss a kid trying to steal his watch. Note to self: Don’t steal Switch’s watch.